When I start to write a new blog I am always anxiously trying to find a recipe that relates to the season in which we live. I am a strong believer of the philosophy that says that nature provides us each time of the year with its produce that is good for our body at that specific time, that it is not so good to buy ingredients from conserves or use frozen ingredients from the freezer. The favorite recipe for 2015 of my friend Annette is a cheese pie that we make only in May (according to my philosophy). 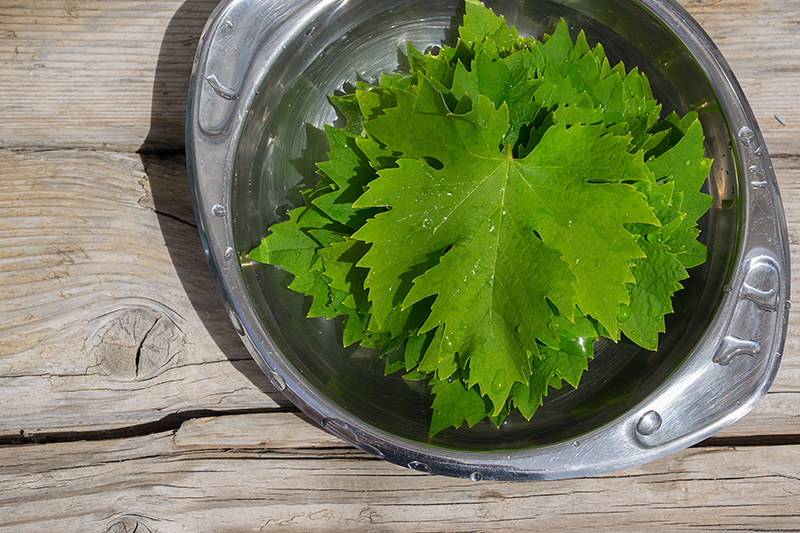 It is made with fresh young grape leaves that we take from the wine ranks that start to grow again after winter. 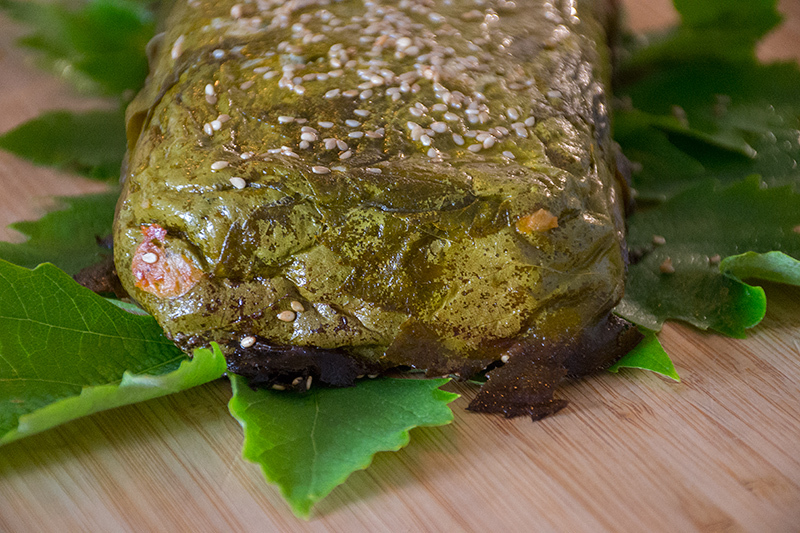 The grape leaves add bitterness to the taste creating a special result. The cheese gives an extra salty flavor to the pie. 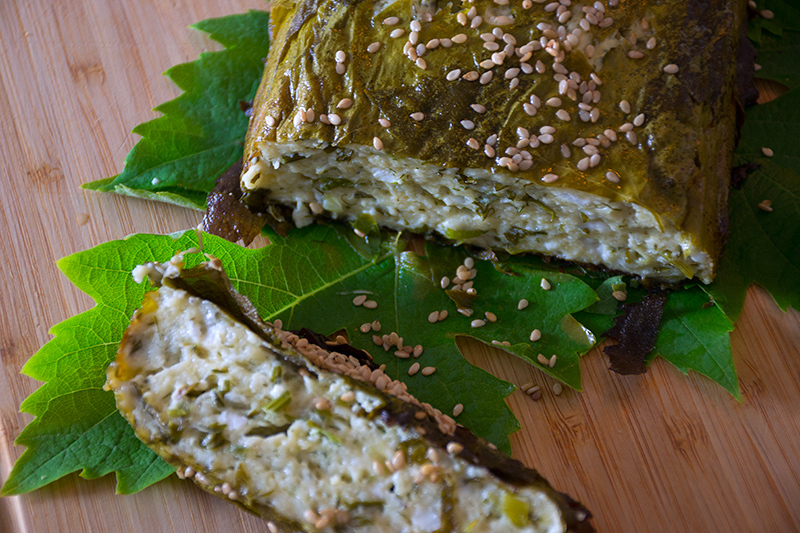 This cheese pie with grape leaves is a traditional tiropita recipe from Pagoneri Dramas in Northern Greece. Last May other dishes got published on Katerina’s Kouzina, but since then she has urged me several times that it is high time I talk about her favorite dish. You probably guessed my response already: “Annette, May is the right moment, not December!” Annette of course, woman of the world as she is, cleverly reacts by mentioning that somewhere in this world it is spring in this moment, and that for sure some of our fans following the blog live there. I realized she is right. My very good friend Al comes from New Zealand, where it is spring right now. Al always cooks my blog recipes and believe it or not, always fine tunes my recipes thinking he is improving them (once he put pine nuts in the spinach pie ;-). And there is my friend Ingrid from Cape Town in South Africa, where it is also spring right now. With passion and a big love for Greek recipes, Ingrid always tries each new recipe giving me feedback of its level of success. Let’s start cooking! 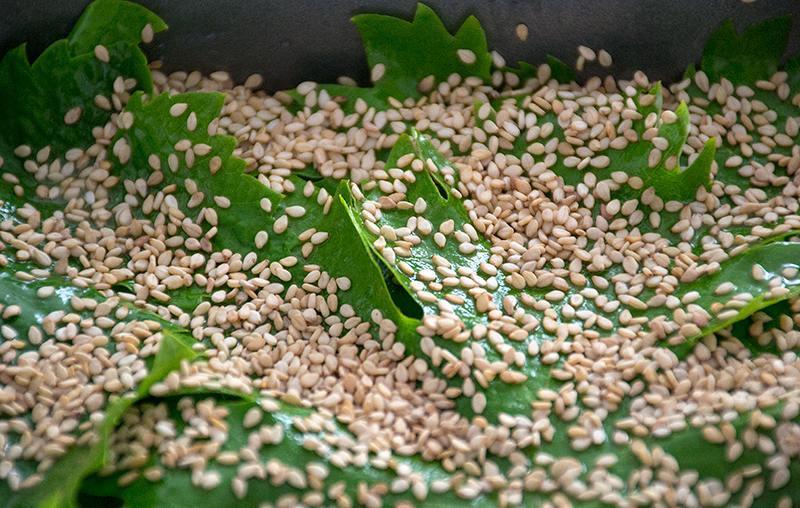 Prepare the feta cheese mixture and clean 30 beautiful grape leaves. Butter the bottom and sides of a baking tray. 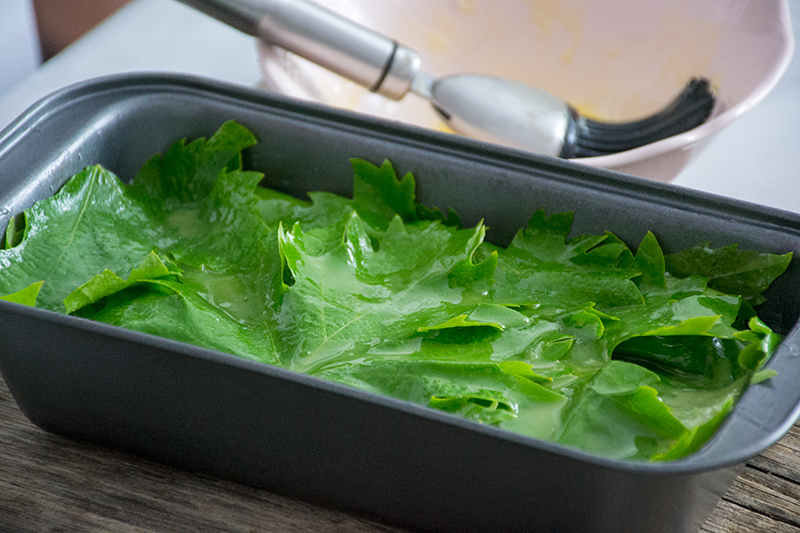 Place one grape leave at the bottom of the tray and with a cooking brush sprinkle some olive oil or melted butter. Repeat this procedure until the baking tray is totally covered. Pour in the feta cheese mixture and smooth with a spatula. 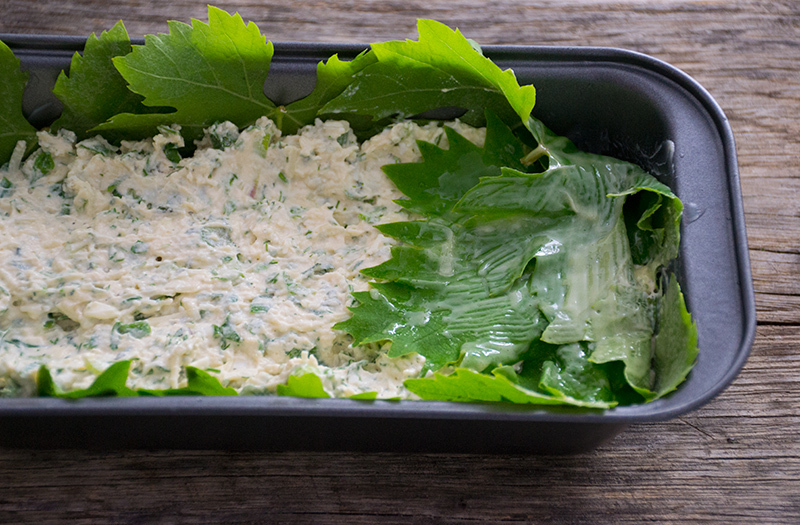 Top the tiropita with the remaining grape leaves, making sure to oil or butter each one before adding the other. Roll in the edges and brush the top with oil or butter. Sprinkle the tiropita with sesame seeds! It’s ready for the oven. Bake for 45-50 minutes, until the phyllo is crisp and golden. Look at how beautiful it comes out of the oven! Enjoy your wonderful cheese pie with grape leaves!! This traditional tiropita recipe from Pagoneri Dramas in Northern Greece calls for a different kind of cheese that gives an extra salty flavor to the pie! 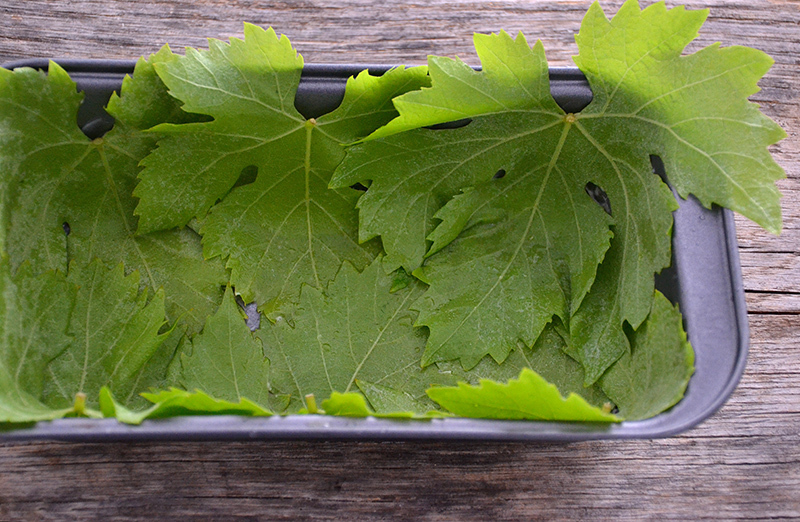 The grape leaves add bitterness to the taste creating a special result. Prepare the filling for the tiropita; use a fork to crumble the feta cheese into a large bowl and add the beaten eggs along with the rest of the grated cheese and milk cream. Chop some fresh mint, spring onions, dill and add it to the mixture. Add the yoghurt and mix well. Season with freshly ground pepper and blend well with a spoon. Place the mixture in the refrigerator for 20-30 minutes. For this pita recipe you will need baking tray, approx. 20-30 centimeters. Using a pastry brush, butter the bottom and sides of the tray. Place one leave at the bottom of the tray and with a cooking brush sprinkle some olive oil or melted butter. Repeat this procedure. Pour in the feta cheese mixture and smooth with a spatula. Top the tiropita with the remaining grape leaves, making sure to oil or butter each one before adding the other; roll in the edges. Brush the top with oil or butter, sprinkle with sesame seeds. Bake the tiropita in a preheated oven at 180 C / 360 F for 45-50 minutes, until the phyllo is crisp and golden. Let it cool down for a while before serving. It looks really delicious. What step do you add the flour?